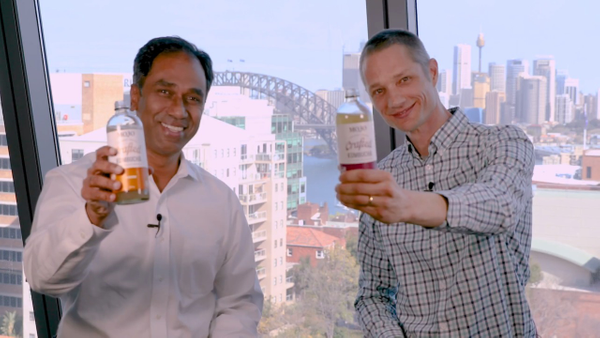 Coca-Cola Adds First Line of Kombucha Through Acquisition of Australian-based Organic & Raw Trading Co.
Vamsi Mohan (left), president, Coca-Cola Australia, and Anthony Crabb, co-founder and CEO, Organic & Raw. MOJO’s humble beginnings link to Crabb’s introduction to the concept of a live-culture drink, which requires a SCOBY-starter (symbiotic culture of bacteria and yeast). This put him on a journey to perfect the MOJO culture, which is at the heart of what makes his brew of kombucha so distinctive. Mohan credits the convergence of several consumer trends with driving MOJO’s rapid growth. MOJO products are currently sold in about 4,000 outlets nationwide. MOJO is available in local health food stores, organic markets, organic café restaurants and supermarkets including Aldi, Costco, Foodland, IGA and Woolworths.